JACKSONVILLE, Fla. - There is nothing better for tired legs after winning your first ever playoff match just two days ago than a five-plus hour bus ride down I-95 to Miami. That, along with facing the top team in the NPSL's Sunshine Conference, Miami FC 2 at their home pitch is what the Armada have to overcome. Head coach Mark Lowry says that the extra rest that Miami FC 2 got not having to play a game this week is a huge advantage. "It is not just this Wednesday game, I feel like the last two months we have been playing Wednesday, Saturday, Wednesday again," said Lowry. "We have had a lot of games canceled and pushed towards the end so, we have been riding this wave. I am hoping the excitement gets the guys through. That helps, when you are winning you aren't as tired." Helping the Armada FC ride this wave has been the loyal fan base, who showed up to see the team board the bus south to Miami for Saturday's match. The players know that through different owners and leagues, it has not been easy, but they recognize and appreciate their support. "This is pretty cool," said Armada forward Conor Doyle. "I didn't know about it until this morning when I got here people were already here. It is nice to see people out here supporting us and hopefully we can put on a show for them tomorrow night." Two fans in particular wanted to make sure that the Armada had their support, so they made posters. Twin sisters Matilda and Olivia Morris wanted to wish the team good luck in their next match. 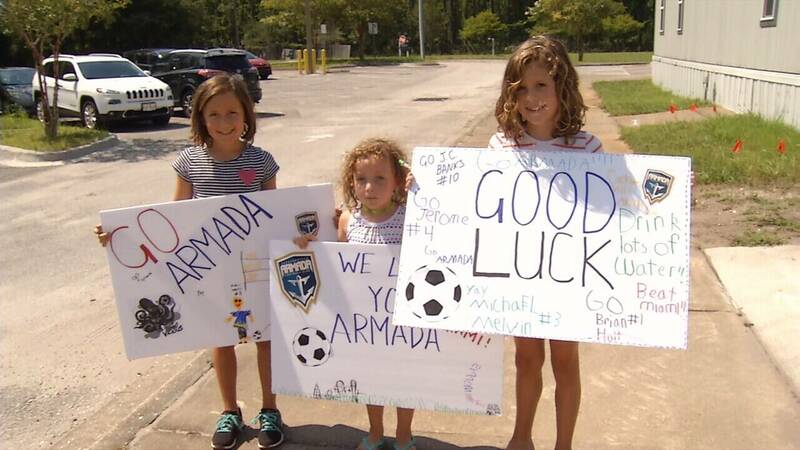 "We are waiting for the Armada so we can send them off," said 7-year old Armada Fan Olivia Morris. "We made posters that say Michael Melvin (Armada midfielder from Jacksonville) and Go Armada!" "My poster says good luck and it has players names on it." said Matilda Morris. "It also says drink lots of water because you have to stay hydrated." The Armada FC versus Miami FC 2 will kick off at 7 P.M. exclusively on WJXT Channel 4.